Hello foodies! How are you today? Have you liked my new blog? I have gotten very poor response at the last post. Nobody clearly answered the first question! Think deeply, answer is very easy. One of you very close to the answer. You have time to answer till Friday. Today, I'm going to post a new recipe and the 2nd question about it. Read the recipe and answer the question. Heat 1-liter milk in a pan. Once it starts to boil, pour in the lime-juice or Calcium Lactate Powder and stir gently. The milk will curdle and clear whey will separate. Strain the paneer in a muslin cloth. Wash under cold running water to get rid of the lemony smell and then hang it for ½ an hour. Get the fresh paneer out of the cloth; wrap and start kneading it with the palm, Knead to make it smooth for 5-6 minutes. Make same size tiny balls from the paneer and keep aside. Heat rest of milk in another heavy bottom pan and push the same button. Stir in between to prevent it from burning at the bottom. 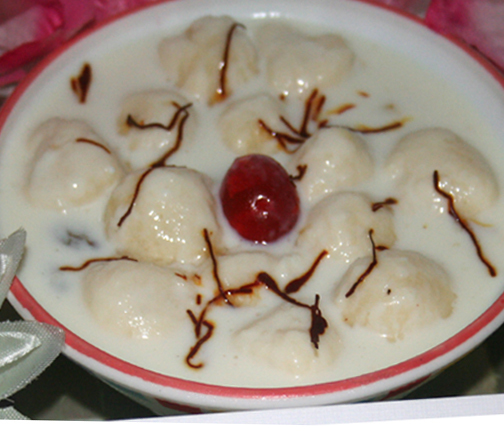 When the milk become ½, mix the khoya to it and stir very well. Continue stirring till it’s thick and creamy. Now, reduce the flame and start adding the balls one by one. Once all the balls are added, add the sugar, vanilla essence, pinch of keshar to it. Let it simmer on the same heat for 3-4 minutes, stir continuously. Make sure there is enough liquid as the balls will soak up lots of liquid during the process of cooling. When it becomes cool, keep it in refrigerator for at least ½hr. Take it from refrigerator; garnish with cherry, honey and serve in small bowls. ** You may use cashew-nut, raisin and other dry food to garnish. 1. After cooking non-veg , generally it smells bad in the kitchen. Put a candle on and the smell would vanish in minutes. 2. Sometimes, we add salt in cooking twice by mistake. Don’t worry; in that case, slice a potato in pieces and add to cooking. Cover it and cook in a low flame for 5-6 minutes. It would regain the taste!! 2. Tell me friends, besides lemon, what can be a substitute of Calcium Lactate Powder? That's all for today. We will meat again next Friday. Hope you like the recipe. Please write what you want more in this blog, your opinions are so valuable to me. Good night. Note: Follow all the steps in the T&C (posted on the F.B. page) to win the prize "Foodie of the Month".